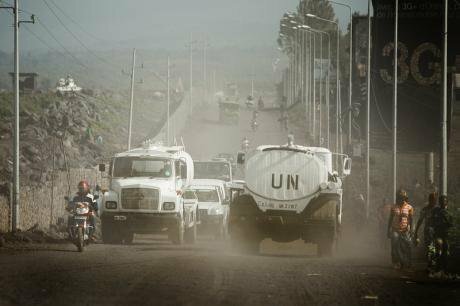 UN peacekeeping troops patrol the roads in Goma, but have they become immune to the environment? Demotix/Ignacio Hennigs. All rights reserved. There are very few roads accessible by car in the South Kivu province of the eastern Democratic Republic of Congo (DRC). One of these is around Bukavu, the provincial capital. The road is used daily by locals, government officials, non-governmental organisations and United Nations agencies, including the United Nations Stabilization Mission for the DRC (MONUSCO), the world’s largest peacekeeping mission. In this area, over a few months in 2013, at least 40 women were reportedly attacked, sexually assaulted and robbed of all their goods while taking shortcuts on their way to markets. As often happens, such incidents went unreported for a long time, mainly because survivors feared being stigmatised as victims, and had little faith that their assailants would be prosecuted. What was happening? Too poor to afford basic transportation, heavily burdened Congolese women walk long distances to reach markets to sell their products. Congolese Armed Forces had obstructed the road to Bukavu with illegal barriers, forcing women who lacked the money to pay the tolls to choose the forest by-ways, risking attack. But even if unreported, the risk of incidents should have been detected. The presence of illegal barriers was well known, but despite some on-going efforts to stop them, almost no peacekeepers from the government, non-governmental organisations or MONUSCO noticed the absence of women transporting goods along the road. This should have been striking considering how common it is to see women carrying large loads on their shoulders everywhere in this area of the DRC.The presence of illegal barriers was well known, but despite some on-going efforts to stop them, almost no peacekeepers from the government, non-governmental organisations or MONUSCO noticed the absence of women transporting goods along the road. This indicates not only a terrible gap in recognising and preventing sexual violence, but also a lack of attention to women’s roles in society, and to women’s potential contributions to security, early warning and early response, and peacemaking. In other words, a lack of concern for what is stated in UN Security Council Resolution 1325 on Women, Peace and Security, which acknowledges the vital role women can and should play in conflict management, conflict resolution and sustainable peace. In spite of growing efforts to raise awareness and knowledge of Resolution 1325 among international actors and national institutions, many peacebuilders are not yet used to applying a gender perspective. On one hand, the importance of gender is underestimated, and its potential to influence peace and conflict is not recognized. This is partly because gender is so rooted in each society’s behaviour that it is often confused with culture, or not even perceived at all–neither in the local peacekeeping environment, nor in the environment of origin of peaceworkers. Peaceworkers take great trouble not to ‘interfere’ with the culture of local people. The difficulties associated with discussing gender norms, while remaining sensitive to the cultural autonomy of the local population, end up being used to justify not working with gender at all. On the other hand, those difficulties have also created the perception that working with gender is the exclusive responsibility of specialized experts, with a specific budget. While this can be true for the implementation of gender programs, it is not true for adopting a gender perspective. The transversal nature of gender necessitates acting with a gender perspective. What dominates is a misinterpretation of ‘gender’, which for most practitioners is largely linked to reducing sexual violence. A shallow interpretation of gender inhibits this aspect of peacework. Although most strategies of civilian protection take into account threats, vulnerabilities, profiles of aggressors and attacks, and even indicators of conflict-related sexual violence, few consider the social roles assigned through gender alongside these other key elements. For example, if collecting water is a role traditionally taken on by women, and (male) armed actors have a record of sexual violence against women, it is crucial that local water points are secured away from them. But understandings of gender are not only about reducing sexual violence; they are crucial to every aspect of peace and conflict life. The transversal nature of gender, just like peace and conflict, means that gender influences women’s and men’s roles and behaviours in practical ways, from the level of the family to the institution. The daily activities conducted by men and women are frequently determined by gender, and can sway and be swayed by conflict and peace contexts. For instance, women’s and men’s daily activities will expose them to different knowledge. Where women are tasked with collecting water and wood, cultivating fields, childcare or visiting markets, while men maintain a breadwinner role, they will have access to different kinds of information which can be essential to recognize conflict patterns; information about a particular community’s needs, specific security threats, and local power brokers. Humanitarian situations can also challenge gender norms. It has been widely reported amongst Syrian refugees that, because men have been uncomfortable asking for assistance, women have added to their traditional responsibilities by looking for humanitarian aid outside of the home. Acquiring this breadwinner status has left some women on the receiving end of frustrations of their male partners, expressed through violence.The transversal nature of gender, just like peace and conflict, means that gender influences women’s and men’s roles and behaviours in practical ways, from the level of the family to the institution. In other cases, working with women directly can be crucial to achieving a sustainable peace. In reintegration programs especially, working with ex-combatants’ wives can be very helpful. Social connections with the host community, which are crucial for a sustainable reintegration, are often created by women via childcare, visits to the market and so on. In all these senses, a gender perspective can provide opportunities to drive positive changes towards peace and gender equality. Yet gender often is not included in peacekeepers’ observations. Why? One explanation is that in conflict situations, “hard issues”, such as armed attacks or massive destruction, are much more visible, easier to monitor and with immediate measurable impact, and so are more easily included in protection strategies. In contrast, gender issues come across as “soft issues”, and are often confined to the domain of “women’s issues”. Gender issues are not seen as priorities that must be considered for stepping towards peace; rather, they are considered ‘consequences’ of the conflict to which provide assistance. Commonly, gender is very much associated with women, rather than the gendered roles of women and men; women in conflict situations are mostly seen as vulnerable objects of peacekeeping initiatives. This understanding of gender relegates women to passive victimhood–rather than to persons that are not vulnerable per se, but are in a condition of vulnerability. This misinterpretation is very costly: not only reducing peace operations’ capacity to prevent violence, but also the participation of key active elements able to promote a sustainable peace. The implementation of Resolution 1325 suffers from this bias: it is often treated as an appendix to weightier matters, rather than being integral to conflict resolution or sustainable peace. The titular focus of Resolution 1325 on Women (rather than Gender), Peace and Security may itself be problematic. It risks being misinterpreted as advocating that the security of women be dealt with differently (and separately) from that of men; stressing the need to promote protection and participation of women, rather than highlighting the interdependence of women’s and men’s security for lasting peace. The existence of specific security threats towards a targeted group, for example the frequency with which sexual violence is directed against women and girls, or the forced recruitment into armed groups of children, does not mean that consequences will affect only that part of the population. Nor does it follow that the strategies of prevention should focus only on the ‘at risk’ group. Rather, the consequences of violations affect the population as a whole, at all levels of society. Attacks against women on routes to market have not only consequences for the victim personally, but on family relationships, where the victim suffers discrimination, and the husbands frustration. The socio-economic stability of the community itself is put at risk when the markets are closed due to declining participation. Consequently, such attacks have consequences also at a regional and national level. Indeed, security does not mean only protection against threats, but the creation of a protected environment at all levels: domestic, community, institutional, and international. Each man and each woman has a role to play in all those levels of security. Gender equality has further implications for security. If men and women do not have the same access to opportunities and rights, the security and peace of the society at large is compromised. An imbalance of rights and participation at the family level can have repercussions nationwide. What is essential is the interaction and participation of women and men together to build peace and prevent conflict. The greater aim of Resolution 1325 to integrate a gender perspective into all aspects of conflict prevention and resolution is thus missed in many efforts to implement it. Indeed, this tendency to dissociate, as opposed to integrate, gender into security and conflict resolution strategies also risks feeding the idea that the security and protection of women can only be provided for by women as security actors. This is only part of the picture. Training all mission personnel in operating with a gender perspective is more important. It is true that there is an immediate need to increase the number of women (military, police and civilian) deployed in peace support operations and to elevate their roles to those of their male counterparts. Female peacekeepers can play crucial roles in certain areas, including women’s protection: assisting women victims of violence, and patrols and community engagement in contexts where social norms restrict contacts between women and men. Female peacekeepers challenge broad conceptions around women’s–and men’s–roles in security. For instance, a Uruguayan female helicopter pilot with MONUSCO has aroused enormous interest among Congolese women, which has supported the mission’s engagement with local people. In Liberia, Indian female peacekeepers in the UN Mission in Liberia (UNMIL) have assumed a very high profile role guarding the President’s office. The percentage of women enrolling in the Liberian National Police rose from 13 percent in 2008 to 15 percent in 2009. The tendency to dissociate, as opposed to integrate, gender into security and conflict resolution strategies also risks feeding the idea that the security and protection of women can only be provided for by women as security actors. However, the presence of female peacekeepers is often the sole emblem of the UNSC resolution. While this is indeed part of the solution, the key is for each actor–male or female, military or civilian–to learn and to act with a gender perspective in all situations. In order to achieve this, a gender perspective needs to be taught, continuously cultivated and practiced before, during and after peace operations. Sharing similar experiences and lessons learned between regions is an excellent way to gradually adopt the gender perspective. Latin America and Africa, for example, are regions that share a number of structural characteristics and face comparable challenges: post-colonial states, corruption, insecurity, inequality, young governments, histories of long-lasting internal conflicts, and post-dictatorial contexts. South-South collaborations between these regions enables a thoughtful approach based on the experiences countries have acquired over the years. Such collaborations, moreover, are all the more pertinent as many Troop Contributing Countries to peace operations deployed in Africa are from Latin American countries. Currently, 12 Latin American and Caribbean states contribute over 1,500 peacekeepers to UN missions in Africa, with the Uruguayan and Guatemalan commitments to MONUSCO being the largest. Resolution 1325 was originally neglected at the Latin American level. Since 2007, RESDAL’s investigations on women in the armed forces across the Latin American region have revealed a number of issues, including a lack of data on the subject, and a lack of discussion of gender issues within peace operations. The research papers promote collaboration between civil, military and police actors to improve gender equality within democratic institutions, and are an important resource for Latin American practitioners. As a result of such efforts, Resolution 1325 and related material were incorporated into the regional agenda within three years, notably in the IX Conference of Defense Ministers of the Americas. RESDAL has been uniquely positioned to use this regional advocacy experience to progress the Women, Peace and Security agenda in international peace operations. After conducting fieldwork in Haiti, DRC and Lebanon, where Latin American countries participate in United Nations peace operations, it became clear to RESDAL that it was necessary to carry out regular and pre-deployment training for military peacekeeping forces. To this end, RESDAL instigated a programme of classes on gender promotion in peacekeeping operations at various centers across Latin America that consider international legal frameworks and field experiences, as well as local understandings of gender. The implementation of Resolution 1325 cannot take shortcuts: the path to adopt is that of a comprehensive, multi-actor and practical gender approach. The 15th anniversary of Resolution 1325 next year provides an opportunity to follow such a path, advocating for an approach based on fieldwork and South-South collaboration to work with women and men towards a lasting peace.